When Akron Brass says deliver heavy duty swing out valves they mean it. Manufactured from marine grade red brass, Akron Brass severe duty swing out valves have been built to resist corrosive and acidic mining water conditions. Heavy brass gears deliver the torque required to operate under extreme stress and pressures. 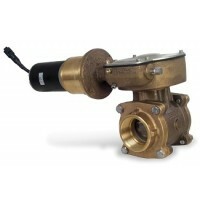 The Akron Brass severe duty swing out valves design makes it quick and easy to swap out the floating ball and seals without having to dismantle the entire waterway.